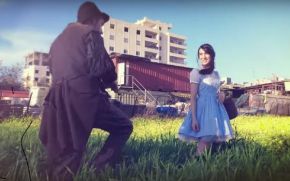 In a first-of-its-kind production Palestinian artist Lina Sleibi has joined forces with European producer Johno to put out an inspiring Arabic cover version of classic film ballad “Over The Rainbow” from The Wizard of Oz. The video was released in the UK on 2nd November 2018. Following a year of intensive work, this stunning production is set against the backdrop of the Occupied Palestinian Territories and features Banksy’s artwork like never seen before. The video sets out to juxtapose the realms of fantasy and childhood, with the harsh reality of being walled off from the rest of the world. Featuring Banksy’s artwork throughout, it magically transports the original Wizard of Oz characters into Occupied Palestine where they meet and interact with animated graffiti in Bethlehem, and along the Separation Wall. This contemporary version of Over The Rainbow, one of the best known film ballads in the world, was mastered in Abbey Road Studios and was produced by Johno - an Irish music producer leading projects in the West Bank and Gaza. The video is directed and animated by Kleopatra Korai, a Greek artist, and produced by John Robert Handal, a leading figure in Palestinian music. Lina Sleibi is a rising star in the international music scene and has toured the US and Europe. “Music has given me a lot, and I have always wished I could share it back with people. “I am grateful for the tiny steps I am taking towards reaching my dream, and feel lucky, proud and thankful to have got this far. The video for “Over The Rainbow, has gained over 1.3 million views online across YouTube, Instagram and Facebook, resulting in an expanding fan base for and a swell in invitations for Lina Sleibi to perform live. She has toured the US and across Europe to much applause.